My favorite things to do in Gothenburg, Sweden | Bonjour, amigo! WARNING: The following content may cause you to book a flight to Sweden ASAP! For this adventure, I will list my favorite things to do in Gothenburg, Sweden. In Sweden, Sankta Lucia is a very important saint. If you are in Sweden on the holiday, which is December 13, you should attend a Lucia concert. 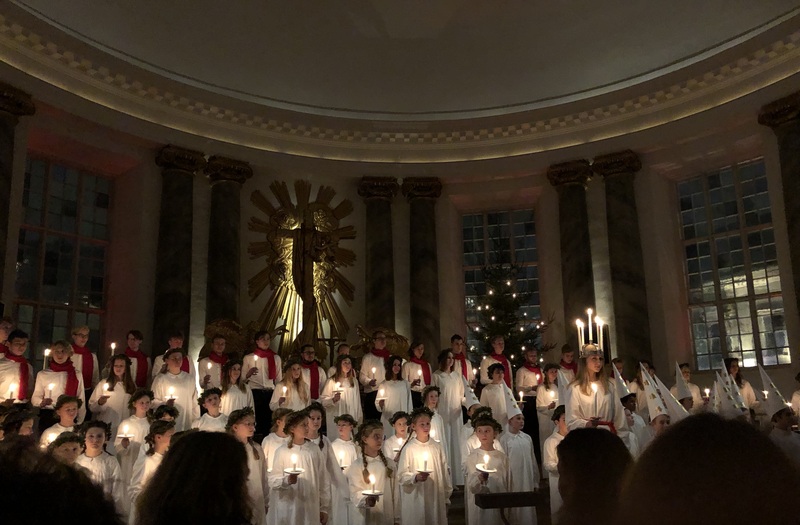 We went to the Lucia concert at the Gothenburg Cathedral. During the concert, many kids stood on the altar holding candles. The girls wore white robes and the boys, known as Star Boys, wore pointy hats with gold stars on them. There was one girl who stood out; she is known as “the Lucia”. She wore a crown of lit candles on her head and a white robe with a red sash. All the kids, except Lucia, sang many songs in Swedish, including “Sankta Lucia”. I loved the concert because it was beautiful. Also, my name is Lucia so I felt like a princess, like the concert was for me. The Universeum is a big museum in Gothenburg. There are many fun things to do there. There is a big rainforest habitat with all the animals that live in the rainforest. There is also a space exhibit where I learned what it’s like to use the toilet in space. 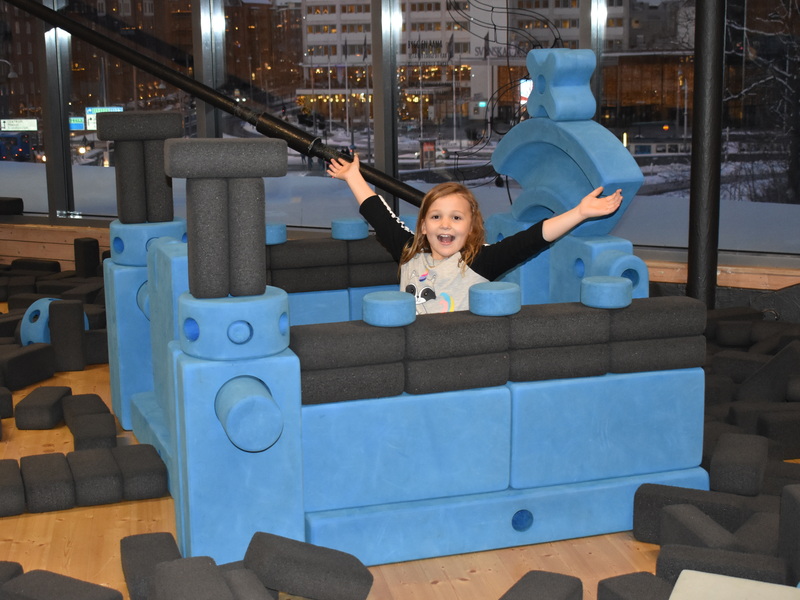 There is a large space for hands-on activities. I built a model Ferris wheel and then a giant castle in the block pit. I also made my own fidget spinner with the help of a very nice Swedish boy who volunteers at Universeum. There is also an aquatic area where you can see different sea creatures. You can walk in a tunnel that goes through the aquarium and there is a giant shark that swims all around you. I had so much fun at Universeum! 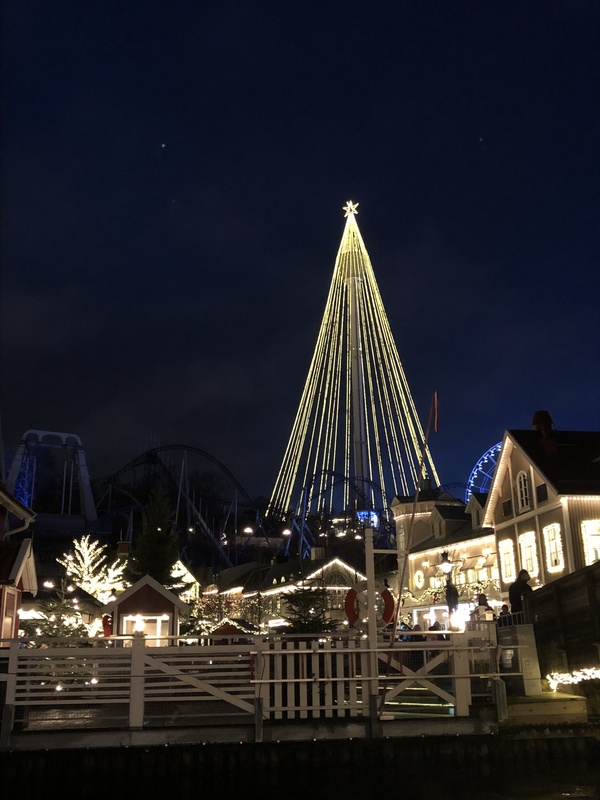 Liseberg is an amusement park. In the winter, it turns into the largest Christmas market in Sweden. There are little stalls where you can buy all sorts of things and places where you can stop to get a snack and hot chocolate. Some of the rides are still going during the Christmas market but we only shopped. We took a boat ride to Liseberg and when we arrived, it started to snow. There is also an outdoor ice rink there. Mommy rented skates for me and I skated through the snow. It was like being in a snowglobe! 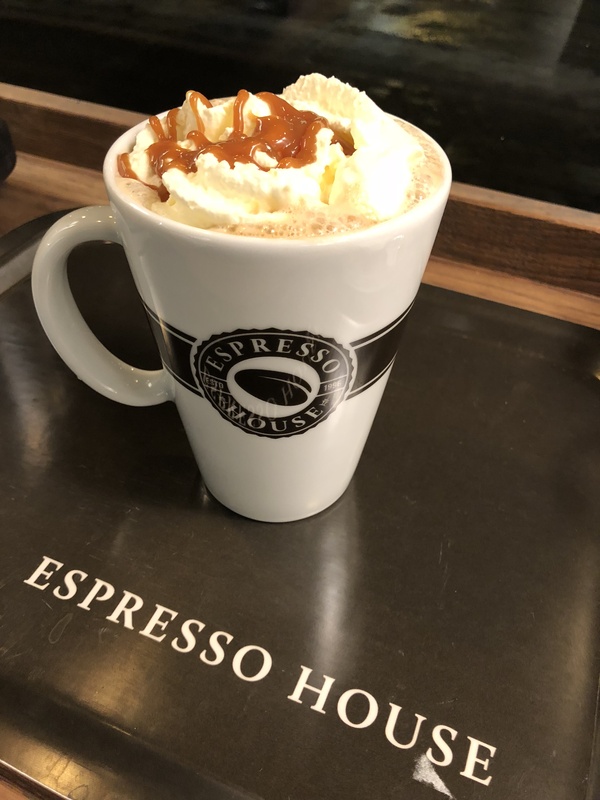 There are many Espresso House locations in Gothenburg and we visited quite a few of them. It is a coffee shop where you can also get hot chocolate, breakfast, and lunch. They have very good food and my favorite was the chicken caesar wrap. It even had quinoa in it! The hot chocolate is really good, too. They put whipped cream and marshmallows, and a chocolate drizzle on top. I definitely recommend going to Espresso House for a snack and to warm up in the winter. Haga is a historic neighborhood of Gothenburg with many shops, cafes, and restaurants. It is very nice and it has cobblestone streets and a lot of old buildings. We visited on a Sunday and many of the shops had stalls and tables set up outside on the street. It was like being at a market. That’s where I found a small Lucia doll to bring back home for my Papa. 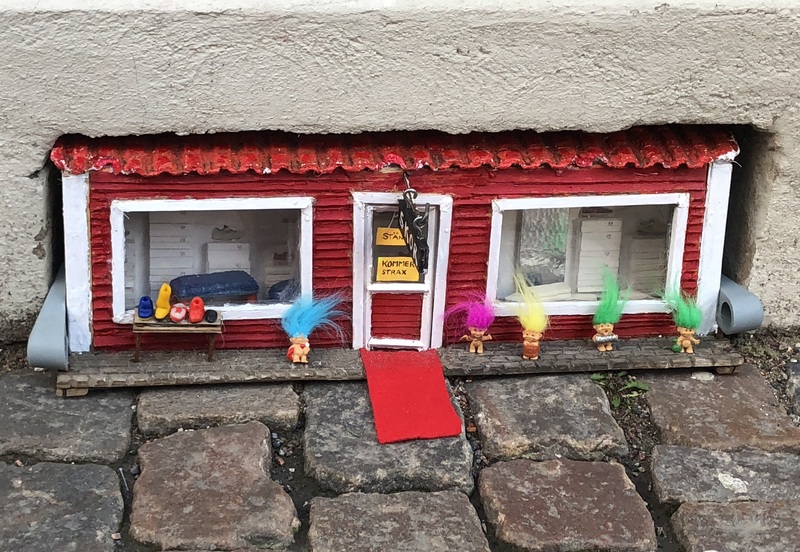 On one of the streets, someone turned vents on a building into little troll houses. They were so cute! The above list contains only some of the things you can do in Gothenburg. There is a lot more to do but I will leave it to you to find even more fun! This entry was posted in Europe, Sweden. Bookmark the permalink. The troll house is absolutely adorable.